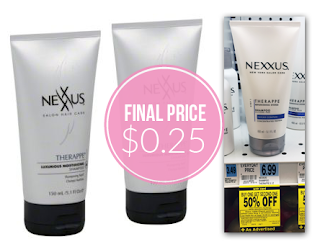 This week at Rite Aid, Nexxus shampoo, conditioner and stylers are buy one get one 50% off. Plus, you’ll also receive 1,000 Plenti Points when you buy two. 1,000 Points is equal to $10.00 that can be used like cash to pay for a future purchase. Buy two bottles of Nexus Therapy 5.1-ounce shampoo for $10.49 out of pocket. At checkout, receive 1,000 Points for a final price of $0.49, or $0.25 per shampoo. NO COUPONS are needed to do this deal! Nexxus products are also included in the 2016 Starting Points promotion. Total $10.49 plus receive 1,000 Plenti Points, making them only 49¢ or 25¢ each after points!